On Friday, April 6th Cambridge Brewing Company will release a true sake-beer hybrid, using house made sake to ferment a unique barley-rice wort mixture. The result is Banryu Ichi, which is brewed to approximately 14% alcohol by volume. It is an incredibly complex beverage with flavors of sweet rice, fresh apples & grapes, earthy hints of mushroom and subtle notes of fennel, herbs and spices. 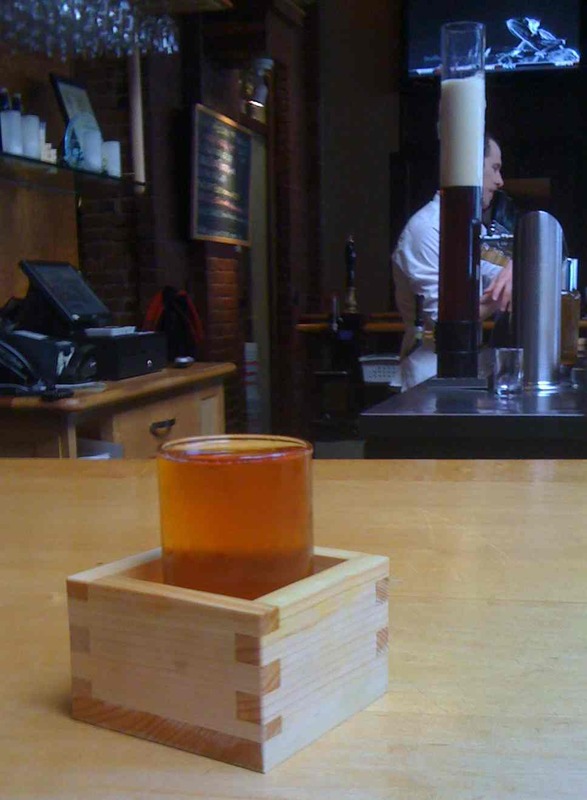 The sake-beer hybrid is being served in a 5oz glass inside a traditional cedar masu (a square wooden box used for drinking sake) and is expected to be available on tap through May 2012. The brewing of Banryu Ichi was a collaborative effort between Cambridge Brewing Company Brewmaster Will Meyers and local sake home-brewer Todd Bellomy, founder of BostonSake.com. The two have been working together on the project for over three years. The brewing process began in January by brewing 100 gallons of traditional sake, a fermented rice beverage gaining popularity in the U.S. Next, they created a custom wort using both pale barley malt and rice. The sticky, thick result was transferred to a fermenting tank and the sake was added to start the fermentation process.